In describing yourself, you have described me! I’ve always said that I can’t pass a bookshop without going in and if I go in, I buy. 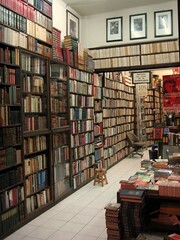 I think my perfect bookshop would be small and quirky and surprising but which can order any book under the sun. There would also have to be sofas and armchairs and refreshments. Yes, I think your perfect bookshop would be very similar to my ideal one, although I must say some of the huge, cathedral-like ones, in beautiful and grand buildings also appeal to me. Maybe there should be a magical bookshop that could become what we have in mind…I can feel a story coming. Happy New Year and thanks for commenting and also for your great posts!